What is "Tiered backlinking" and Why should I care? Tiered backlinking is the one method of building authority links to a relevant page on your website. Imagine that you have created an SEO optimised page and now you need to create backlinks to it. You need to build these backlinks in a tiered fashion. We use tiered backlinks because the quality of backlinks matters. You do not want bad quality links pointing to your main webpage. When creating a link building srategy for a site you must first consider where your visits will come from outside of search. If a site can provide a natural referal and be relevant to both content and audience then that is considered a Tier 1 backlink. These are organic referals that make sense to point to that page. If a page is relevant to either Audience OR content then it is a lower quality referal. This might be on a keyword relevant page but out of context or it might be on a site that has the relevant audience to you but not relevant to your content. Links from these pages would be considered Tier 2. These links point to the pages that contain your Tier 1 links. They help to builds up the authority of links pointing to your site. Now you are probably wondering why I recommend that you optimise / build links for a site outside of your own domain. Well the creation of Tier 2 and Tier 3 backlinks can be partially automated and dont need to be of very high quality. We are using them to build up the authority of the pages that drive traffic and authority to OUR site. So why do this? High authority pages are difficult to get links from unless you own the domain yourself. By obtaining links from moderate auhority sites and then building up the authority of those pages ourselves we can gain benefit of quality aged and relevant links to our site. Tier 2 - Lower quality but from a relevant / keyword rich site or page that points to your Tier 1 link page. These can be from authority sites but are only partially relevant either content OR audience. Tier 3 / 4 - Link from high authority but non relevant page could be from a profile link or a web 2.0 social link. These are of lower relevance and used to bolster the relevance and authority of the tier above. 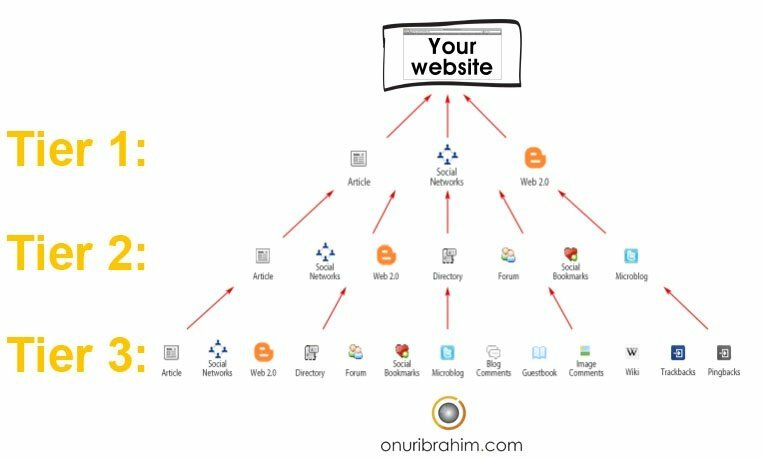 Combining this Tiered link building structure together with social signals and reviews will help to grant your pages and domains a higher authority value and push up your search rankings if your on-page / on-site optimisation is up to scratch first.